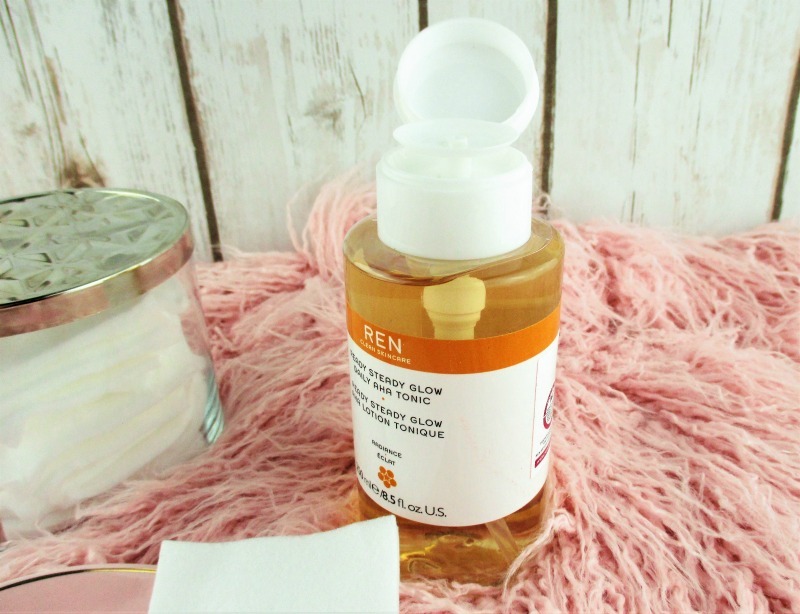 Ren is a skin care brand that I have wanted to try for some time, now so I was thrilled to receive the product that I am sharing with you, today to try. In times past, I've not been the biggest fan of toners but recently, I've been using them more and more consistently and I have to say, my skin seems to be enjoying them. The thing is tho, while those toners I've been using are nice; they sweep away any left over makeup residue and make my skin feel fresh and sparkling clean, they don't contain any active ingredients that make a real, visible difference in my skin. Until now. Ren Ready Steady Glow AHA Daily Tonic, 8.5 fl. oz/250 mL - $35.00 at Sephora is an effective, skin resurfacing toner that exfoliates, brightens and provides a radiant glow yet it's gentle enough to use, every day. Lactic Acid, Willow Bark Extract and Azelaic Acid Precursor join forces to stimulate my skin to increase cell turnover and exfoliate while it smooths, improves tone and helps to reduce pore size. 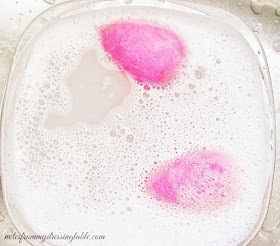 My skin looks brighter, more radiant, it feels even softer and more silky smooth and call me crazy but I think that it even feels a little firmer. Consistent use of AHA can reduce the appearance of fine lines and wrinkles. Did you know that achieve a natural glow, our skin needs to reach a pH of 3.5 to 4? I'm delving a little more into the scientific side of skin care, as opposed to simply the anecdotal and pH is a subject I want to know more about, as I want to continue to maximize the effectiveness of my skin care while making sure that it has an optimum formula that can do the most good. This toner has a very light, fresh, natural citrus/floral scent that I think won't bother unless you are extremely scent sensitive or averse and the fragrance dissipates, almost immediately upon application. I like to use Ren Ready Steady Glow AHA Glow Tonic after I cleanse, before I start applying my essence and serums. This toner has one of those handy, dandy push-pump delivery system that helps me to control just how much of the product I am dispensing and it's clean and neat to use, while eliminating the possibility that this fumble fingered klutz will spill the contents of the bottle out all over my dressing table where, I can assure you, it will do the faux marble surface not even a tiny bit of good. I use a Shiseido Facial Cotton square to sweep the formula all over my face, avoiding my immediate eye area and my lips. This glow tonic lays a pretty good little sting on me but it isn't that uncomfortable and it doesn't last long and it's something I can handle it, easily enough. Once it sinks in, I go on with the rest of my skin care routine. I love that this toner doesn't make my very dry skin feel dried out or too tight. I've only used this product a few times but my skin is already responding. I can't wait to see what this lovely stuff can do for my complexion, over the longer term. Needless to say, if you are very sensitive of skin or you are new to Alpha Hydroxy Acids, test a small area then go in slow, using it a couple of times a week and building up to daily. Don't forget to use an effective sunscreen, every day to protect your new, fresh, glowing complexion and prevent further UV damage. 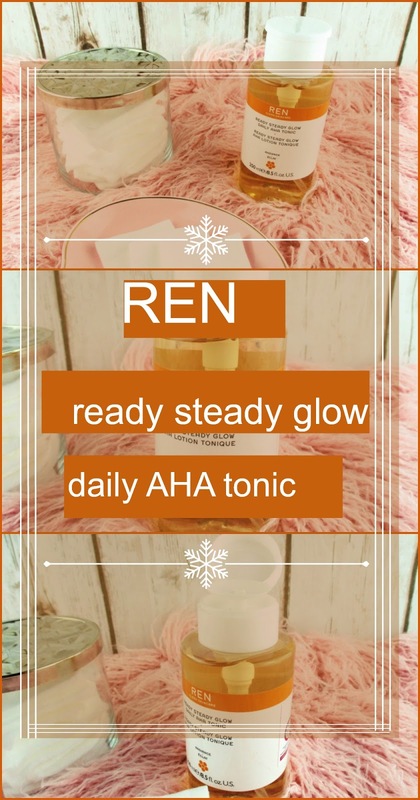 Ren Ready Steady Glow Daily AHA Tonic is cruelty free, vegan, free of gluten and nuts and Ren recycles their packaging and uses responsibly sourced board, natural inks and natural fragrances. 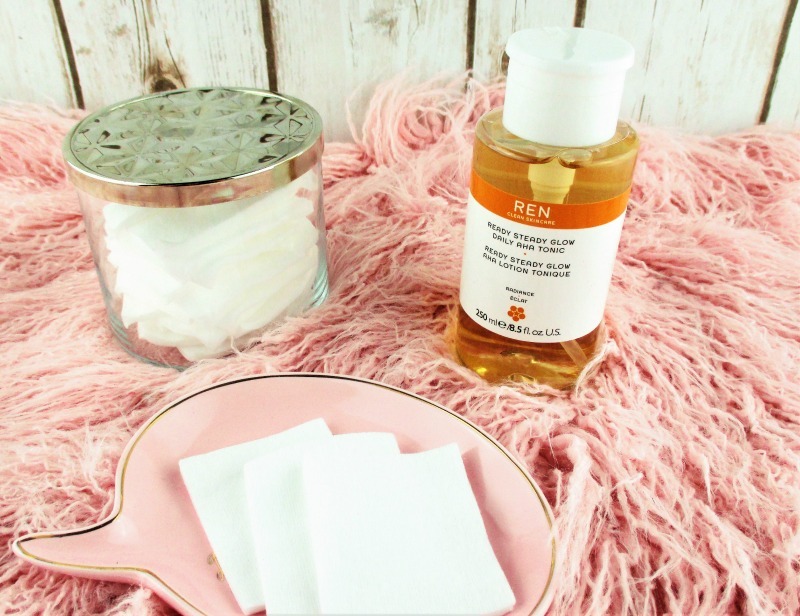 Have you tried or do you use Ren skin care? So far, I'm incredibly impressed with the quality of this glow tonic and this line is one I would love to explore, further. 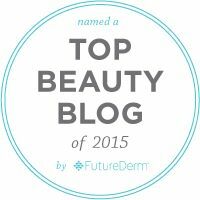 This post is in collaboration with my fellow Makeup Wars bloggy buddies, please scroll to the end of this post to find the links of all of their posts and see what beauty products are their must haves, this winter. Thank you for visiting and reading my blog! If you enjoyed this post and found it helpful, won't you give it a share? You'd really be helping me out and I appreciate it. I have been wanting to try this, and since I love REN, and trust your opinion– on my list this goes! Telling me that you trust my opinion is the greatest compliment that you could pay me. Thank you. <3 I hope that you do try this glow tonic and that you love it. I have tried some REN and I've liked everything so far! I also love that type of dispenser lol it makes it so much easier to get the product out onto my cotton pad!! The dispenser top is everything. I need it on ALL of my liquid skin care products! It would save me so many spills and so much money! 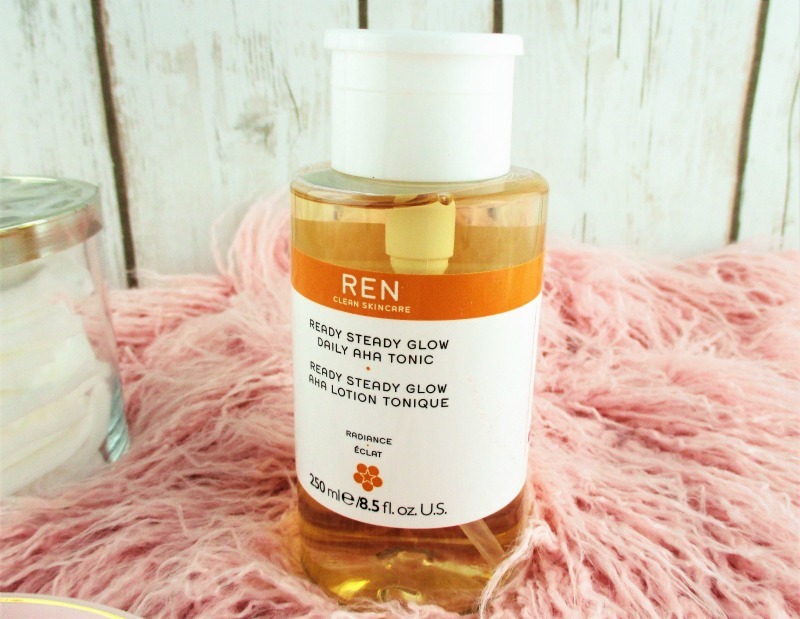 lol If the rest of Ren's skin care is as good as this glow tonic, I would love it! This is one I've had my eye on! I'm glad you love it so much! Do give it a try, it's so, so good. Great to see what you've been loving recently. I want to give it a try now. I'm a huge Ren skincare fan! I've never tried Ren but you make me want to do so. If it helps with pore size I think I'd like it. I just need to smell it first to decide.